Teachers demonstrate inside the Capitol Wednesday, the third day of an ongoing walkout. The deduction allows property, such as stock or ownership interest in Oklahoma-based businesses, to be deducted from state income tax. A state revenue analysis of the bill found that removing the incentive would bring in about $30 million for the upcoming fiscal year and $120 million a year moving forward. Whether the money for the proposal would be enough to appease educators and end their work stoppage is unclear. 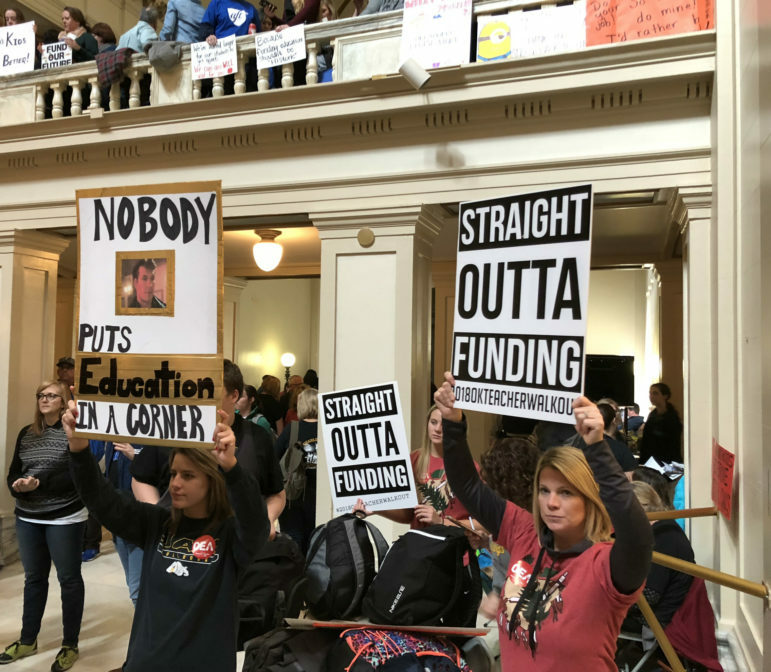 But the Oklahoma Education Association included the proposal as part of its funding proposal and the Oklahoma City chapter of the American Federation of Teachers has made its passage a priority. Even before the teacher walkout, the proposal proved to be controversial. The business community said removing it would stymie economic growth; others, including a state-commissioned consulting group, disagreed, called it a waste of money that benefits a small number of people. But the hunt for money to go toward public education – something legislative leaders and Gov. Mary Fallin said they would continue in the wake of passage of the revenue package that paid for the teacher pay raise bill last week – has amplified the debate on the tax deduction. The Republican-authored bill, SB 1086, has been sitting in the House since the Senate approved it on a bipartisan 30-10 vote on March 15. House Democrats have tried procedural maneuvers to force a floor vote on the proposal during each of the first two days of the teacher walkout. But on almost fully party-line votes, those motions have been rejected by the Republican-led chamber. House GOP leaders have been tight-lipped on why they haven’t set a floor vote or if they plan to do so. But some of their colleagues in the Senate have been more vocal. Sen. Dave Rader, R-Tulsa, who is the lead sponsor of the bill, even took to Facebook urging his followers to contact their representatives and encourage them to pass it. “I ran this bill on my own accord and not at the behest or urging of any organization because the simple truth is that this deduction as currently written hurts the people more than it helps them,” he said. Since the capital gains deduction was put in place in 2005, about 17,000 to 18,000 tax filers a year claimed the deduction. For tax year 2014, the latest year with data available from the Tax Commission’s biennial tax expenditure report, 18,856 filers claimed deductions amounting to $105.3 million — about $5,666 per filer. Consultants for the Incentive Evaluation Commission, which studied the tax credit last year, found over the life of the program that individuals making more than $200,000 a year claimed, on average, 85.8 percent of the total deduction amount. The theory behind the tax break, as the consultants pointed out, is that eliminating capital gains taxes makes investment more profitable. But ultimately the consultants recommended the deduction should be repealed after concluding the program has created a net cost to the state to the tune of $465 million between 2010 and 2014 alone. But the incentive commission, a group of political appointees, suggested retaining it on a 3-1 vote. But others said data limitations were why the consultants couldn’t show that the program was beneficial to the state’s economy. And the State Chamber of Oklahoma argued after the Senate’s passage of the bill that removing the exemption would discourage investment in the state and hurt both large and small businesses. The Oklahoma Council of Public Affairs, a right-leaning think tank, and former U.S. Sen. Tom Coburn, R-Oklahoma, are among others who advocate keeping the incentive. Coburn, noting that Texas has no income or capital gains taxes, argued this would put Oklahoma at an economic disadvantage. “Policymakers should turn their attention to their number-one job as an elected official during times like these, which is the tough but necessary work of strong fiscal governance and oversight,” he said in a statement. But with no signs that teachers will relent and end the work stoppage without further legislative activity, Democrats and education supporters said they will put pressure on leadership and rank-and-file Republicans in the coming days.